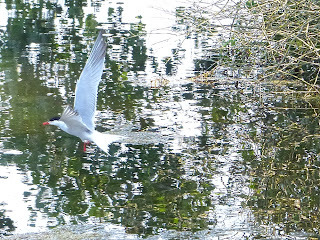 The two Black-Headed Gulls that turned up the other day were indeed the vanguard of the winter army. There were at least ten of them today on the Long Water. 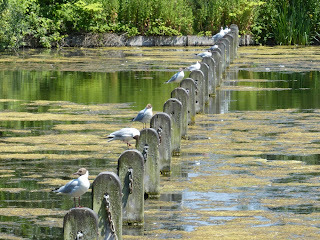 Here are some of them on the posts at Peter Pan -- this is the long shot that all the visitors take, and a bit corny, but never mind. 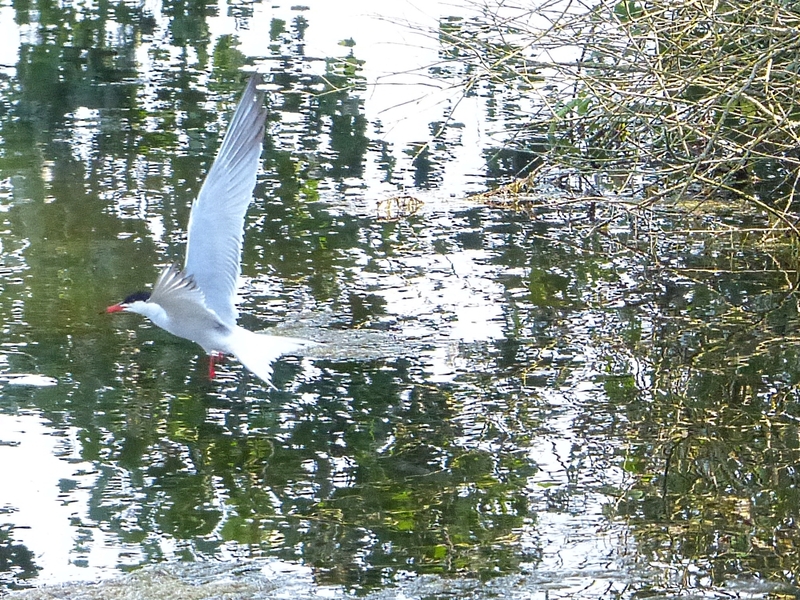 In the background you can see the two Common Terns, which have also come back and are behaving just as before, with the male bringing the female fish. 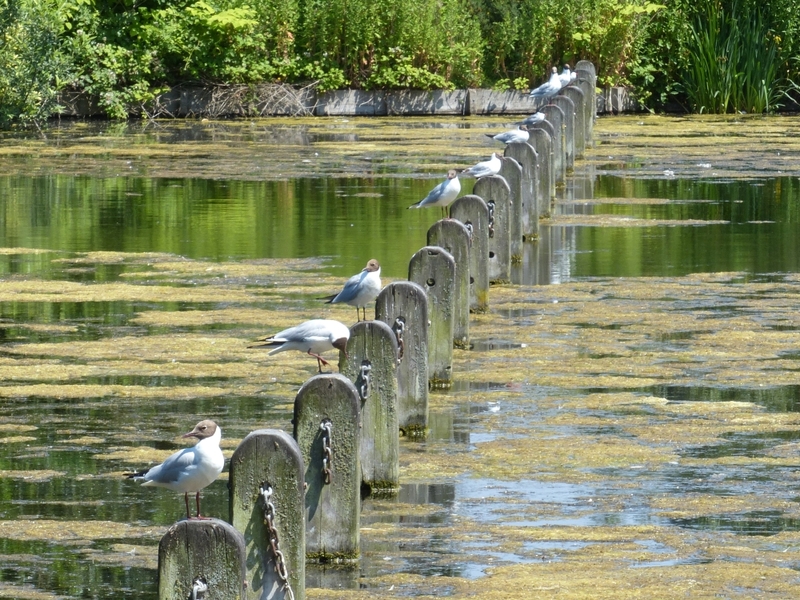 He has stopped hunting near the Italian Garden, a sign that the shoal there must have moved, and now flies down to the Serpentine bridge, probably to try his luck around the wire mesh baskets of twigs which are still teeming with fish. Here he takes a look around near Peter Pan, but didn't stop to take anything. The fish here are only fry an inch long and not yet worth his time. 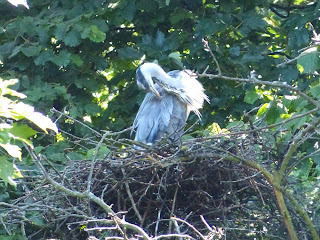 The Grey Herons on the Serpentine island seem to be interested in nesting again. They started nesting in spring and gave up during the spell of cold weather, after which there was no further activity till today. It is still too early to say whether they are serious or not, and it may be too late in the year for their lengthy incubation. Meanwhile, in Regent's Park and Battersea Park, the herons have already got through the whole process and their young are flying around. No sign of the Tawny Owls. Nor of the Little Owl: maybe he has found a new perch in the tall lime tree next to the sweet chestnut where their nest is. The happiest explanation would be that they have bred successfully and taken their young into the leaf yard nearby. But no one has seen the slightest trace of that. 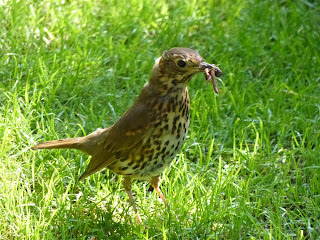 This Song Thrush was poking around in the grass along the Flower Walk, and doing rather well. 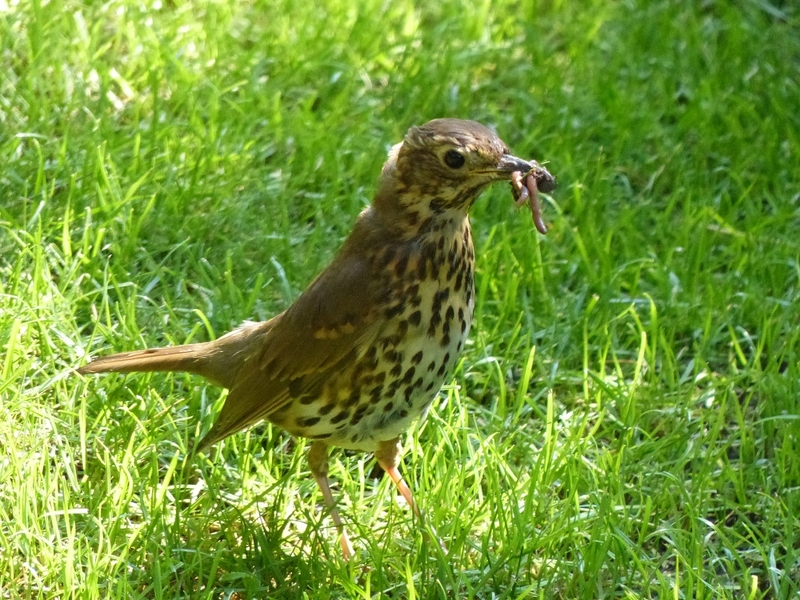 It is a good place for worms because the flowers are regularly watered and the soil remains soft even in dry weather.